There’s nothing better than boating with your family, and the excitement your kids bring only helps you remember why you fell in love with it yourself. If you’re ready to join the millions of families in the United States that enjoy boating every year, you couldn’t make a better decision. That being said, there are some extra precautions you should take when boating with your children. Having rambunctious young ones aboard means you have to pay more attention. After a few trips, though, your kids will know how to behave, and you’ll have some extra crew members. With the right approach, you can foster a love for boating while spending quality time together. Read on for tips on how to have a fun, safe boating adventure with kids of any age. Little ones should always wear a life jacket, at least when you’re in transit. Generally, the U.S. Coast Guard requires children under age 13 to wear one while the boat is moving, but this can vary by state and body of water. Even if your kid is a good swimmer, a life jacket provides peace of mind for you and is always a good idea. Not all life jackets are created equal. You’ll want to find one that has the right design and one your kid likes to wear, too. The bulky, block lifejackets aren’t fun for anyone to wear for an extended period, and you want your child to be comfortable and happy. Bring your child with you to the marine supply store and let them help pick their life jacket. This ensures you get one you’ll both like. Just be sure to select one that has head floatation and is self-righting, so it will naturally keep your kid’s head above water without effort. Make sure the life jacket has slip-out prevention, like a crotch strap, too. Once you pick out a lifejacket together, test it in a controlled environment, like a pool, to make sure it works correctly. You should always have a first aid kit on board, but it’s especially crucial to have one when boating with kids. You might also want to add a pair of surgical tweezers to your kit — they come in very handy in case of a splinter from a wooden dock. If you plan on boating in an area known to have jellyfish, consider keeping some vinegar in your first aid kit, too. While minor stings from most species you’re likely to encounter aren’t a big deal, it’ll help ease any lasting stinging and discomfort. Always keep your first aid kit and other emergency equipment where it’s easily accessible — you don’t want to have to dig for it when you need it. Get your kids a pair of shoes that they can easily slip on and off if you plan on tying up at a dock and going ashore. Flip-flops are better than nothing, but closed-toed shoes are best — they’re less likely to catch on something like a dock cleat. Long days full of fun in the sun mean you and your kids need protection. Be sure to keep sunscreen on your boat and apply it liberally and often, especially after swimming. Even the water-resistant sunscreens are only designed to last for 90 minutes. Sunscreen is good, but shade is even better. When you go to the store for a life jacket, let your child pick out a hat they like for sun protection, too. The reflection of the sun off the water can be damaging to your eyes. Everyone, including your kids, should wear sunglasses to protect their eyes from the UV rays. When you keep your little ones happy and safe, they’ll love going on the boat, and you can start making lifelong memories from the get-go. Take a look at these tips to help your kids develop a respect for boating with safe practices and have fun — no matter what age their adventures on the water begin. Bring Plenty of Toys: A toddler without distractions can be a ticking time bomb. Bringing plenty of toys for the little ones can buy you extra hours on the boat and a more relaxed environment. If you can manage it, keep toys onboard that your child can only use on the boat — this can work to keep the youngest ones excited to get on and stay on for the day. Give Your Child Their Own Area: Especially for kids under seven, having their own space where they can hang out and play with their toys helps them feel comfortable on the boat. Make their area feel comfortable and safe with pillows and their favorite toys. Keep It Short: Especially with little kids, short boat rides are the trick to making boating seem fun and not like a chore. Let the kids get excited about the boat gradually, and you’ll be able to go on longer trips soon. Have Them Take Early Swimming Lessons: It’s a good idea to have your kids take swimming lessons before you start your boating adventures. Not only will it help make your kids comfortable on the water, but it also gives you peace of mind. Swim: It’s always fun to find a secluded cove with protection from wind and waves where you can anchor and swim off the stern. Kids should always wear their lifejackets until they’re confident swimmers — the goal is to get them to a point where they can swim safely on their own. Be sure your kids don’t get too far away from the boat and that they don’t swim underneath any part of it — when it moves up and down with wave action, it can be a hazard. Take a Trip to Shore: If you go ashore, bring a mesh net and a bucket. Kids love digging for sand and looking for critters in the shallow water. Boating for the really young kids is less about being on the water and more about playing. And a day on a sandy beach digging and running through the shallow water is always a favorite. Watch for and Feed Wildlife: Feeding wildlife is always fun — as long as it’s permitted, of course. Bring a little extra bread to feed birds for some entertainment at meal or snack time. Inspire Their Imagination: Sparking your kids’ imagination can help get them to share your obsession with the water. Nautical-themed toys, coloring books and stories can have them dreaming about watery adventures. There are several good ocean tales to read to your little ones that the whole family will love listening to. If you bring art supplies like crayons or paint aboard, be sure to take them off, so they don’t melt. Or round them up at the end of the day and put them in a sturdy container. Swim: Swimming is always a favorite among this age group, and by now, they should be better swimmers and more able to safely entertain themselves. A wetsuit can be an excellent present for your kid once they fall in love with swimming and snorkeling. Even in reasonably warm water, it’s easy to get cold before they’re ready to stop snorkeling and swimming, but a wetsuit will let them play for hours and be warm. Snorkel: A mask and a snorkel can have your kid entertained for hours as they explore underwater wonders. Have On-Anchor Activities: Anchor up and fly a kite! If your child gets bored by the classic type, try one that’s maneuverable — kids love playing fighter pilot. You might also buy wildlife guides and binoculars for your kids — and you — to use. There’s often fascinating wildlife on the water, and having a nice pair of binoculars really enhances the experience. Sometimes the books alone are enough for entertainment, too, even without wildlife around. Look for Marine Life: If you go into the ocean, be on the lookout for large marine wildlife like dolphins, whales and sea lions. Not only will they amaze you and your kids, but they can also inspire your kids to learn more about the ocean and the environment. Let the Kids Navigate: One way to keep the kids more involved is to let them direct where you go. They love feeling in control, and you can even let them sit on your lap and have a turn at the wheel — as long as you’re in open water and not near other boaters. Before you let your kid take the wheel though, check to see if your state requires a boating safety course. Take this opportunity to explain the basics of boating navigation, like channel markers, buoys and common courtesy around other boats. Try Tubing: While kids at this age may not be ready to participate in skilled watersports, most love going tubing. They get bounced around behind the boat as they cross the wake and other waves — you can even ride along with them and have your spouse take the helm. If you do start tubing, make sure to follow all regulations for watersports in your area, which may include using a ‘swimmer in the water’ flag. Let Them Participate in Crew Duties: You may be surprised to find how much kids love to become designated crew members — they’re often eager to prove themselves, and it helps them learn valuable boating skills. When they’re mature enough, ask for help with things like lines, docking, anchoring and navigating. Teach Them How to Tie Knots: Learning how to tie knots is essential to becoming a competent boater — most kids love learning them and showing them off to each other. Teach your kid some common knots and ask them to tie a few when they become confident. It’s fun to turn knot tying into a friendly competition, too — the first one to tie a bowline wins! Bring Games: Board games are a great way to spend some quality family time on anchor when the other activities have wound down for the day. Have Them Participate in Watersports: A lot of teens are all about watersports like wakeboarding, skiing and wakesurfing, and these activities are some of the most fun in boating. With a few other friends on board and music playing, you’ll have trouble not joining in the fun yourself. Be sure to look up the requirements for watersport safety in your state and also the body of water you’ll be visiting. Often, lakes will have their own rules in addition to state regulations. Pack Games: A pack of cards can be an easy crowd-pleaser, and it can keep the fun going, even on cold days. Make sure to pick out a few and memorize the rules before going out for the day. If you’re not afraid to get a little wet on a sunny day, water cannons can lead to a fun, playful fight, too. Try SCUBA Diving: If your teen is interested in snorkeling and what lies beneath the water, consider taking a SCUBA course together and getting your certification. SCUBA diving leads to unforgettable explorations, and you can discover the fascinating underwater world like never before. You have to be 15 years old to get your Open-Water PADI SCUBA certification. Learn to Navigate: If your teen has their boating license, let them be captain for the day. Under your supervision, they’ll quickly learn how to drive, anchor and dock — they’ll learn essential boating skills and be able to effectively help you. If your teen is interested in getting a boating license, make sure to check out the requirements in your state. As lifelong boaters ourselves, we know that making memories on the water with your family is priceless. 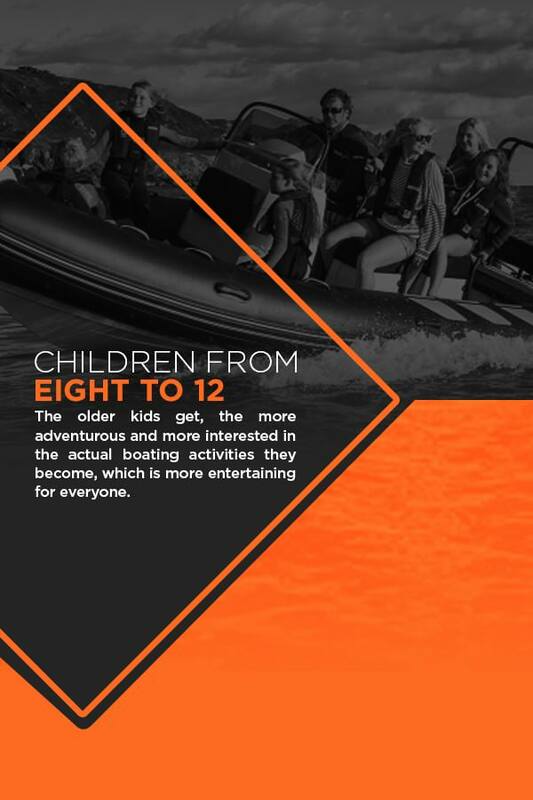 And we’re proud to offer a range of rigid-inflatable boats that are perfect for families and unmatched for safety and pushing fun to the limit. RIBs are trusted by the U.S. Navy Seals for their reliability and seaworthiness and are statistically proven to be safer than other types of vessels. Our boats are built to be nothing less than the best because we know the safety of your family depends on it. If you have any other questions about boating with your family or would like information about our line of boats, please contact us today.